Digital DocMan by BASYS DocMan was designed to be easily incorporated in your current working environment, allowing you to scan in documents at your convenience. Documents can be scanned immediately, or they can be grouped with a cover sheet for batch scanning. Cover sheets containing bar codes can be printed and placed on top of the corresponding documents. At the end of the day, all the documents with cover pages can be scanned at once and DocMan will automatically file the documents accordingly. DocMan will help you reduce many of your costs, while allowing you to be more productive and efficient. The system is extremely versatile in managing your business information to optimize your effectiveness. It can be customized to fit your current data flow to work the way you want it to work. Best of all, DocMan contains many useful features at a fraction of the cost of most document management systems. Return-On-Investment is only months, or even weeks! Capture anything related to a customer/client/patient, vendor, prospect, employee, etc. Batch Scanning allows for multiple people to enter in the indexing information for each document into the DocMan database (without having to scan at that time). Cover sheets containing bar codes are printed and placed on top of the corresponding documents. You continue this process throughout the day and then at the end of the day (or whenever it is convenient for you) you walk over to the scanner, put in the batch of documents with the cover pages and scan the documents. DocMan will then sort and assign the documents based on the cover sheet bar code for that particular document. An advantage of "Batch Scanning" is that your organization does not need a dedicated employee to perform the data entry indexing and scanning function - it allows this function to be divided up across your staff and also maximizes your scanner investment. 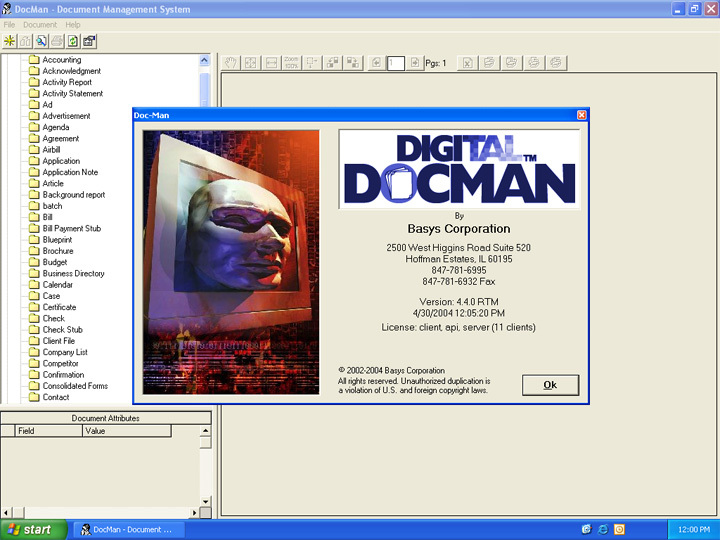 Digital DocMan uses familiar Windows user-interface screens to help you scan, search, view, print, and share all of your documents. The primary search window is similar to Windows Explorer, but much more powerful. While the folders may look the same, they can be re-sorted to present documents in a completely different order. 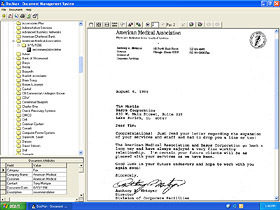 To start the process, you scan in your document. 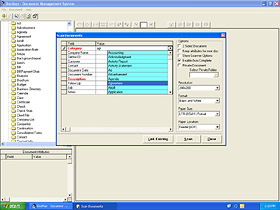 A group of attributes can be entered for each file. 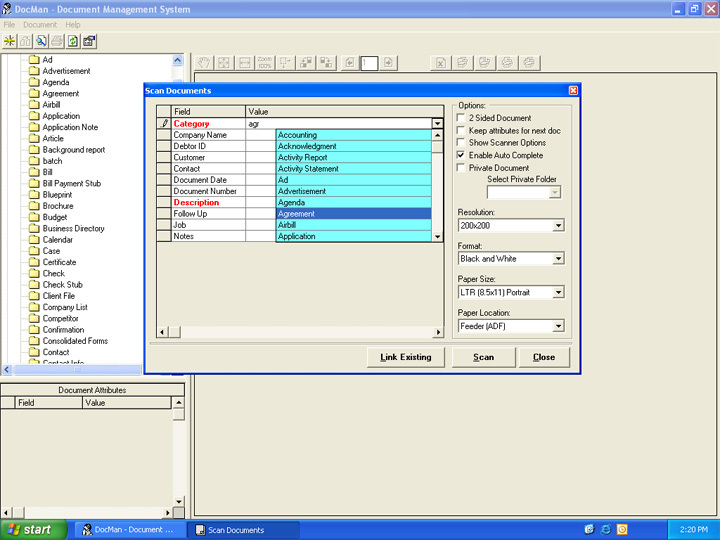 The attributes that are saved with the documents are user defined. This means that while one company may use Category, Company Name, Contact, etc. to identify each document, another company may simply use Client Number, Client Name, Account Number, and Document Date. These fields are set up at the time of installation, but additional fields can be added at any time. There is no limit to the number of fields that a company can use. These fields can be text, numeric, or dates. Notice the dropdown list while adding a field value. Each field has a pull-down list of previously entered values. This helps with consistency during data entry. Also note that double-sided documents and private documents are easily managed. Private documents will be stored in private subdirectories on the server, with Windows 2000 handling the security of the files. If a user's ID does not allow him/her into the subdirectory, Digital DocMan will not allow him to view or print the files. Once the documents are stored, several search techniques may be used to retrieve them. First, a common search through the folders in the top left window may be the simplest and fastest. Second, you can enter a key word and the text search will look through the fields for a matching entry. Finally, if a more complex search is required, you can build a search statement with multiple fields, using several joining statements. All have the pull-downs available, as during scanning. 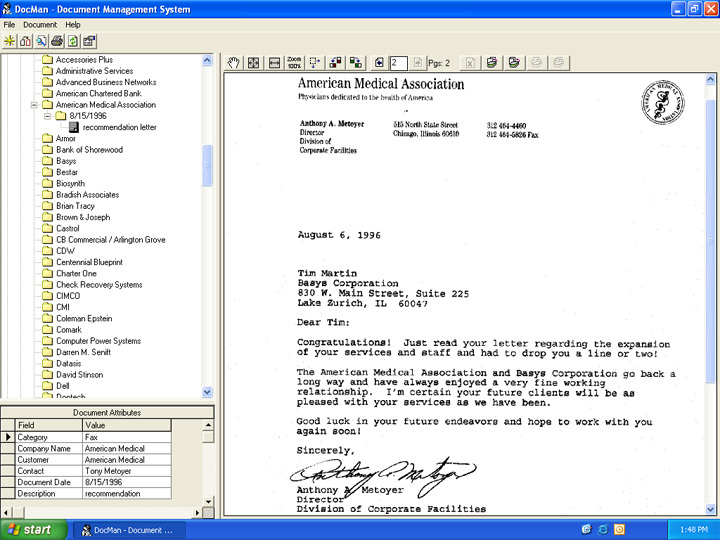 After a document is found, it will be displayed in the right-hand window. 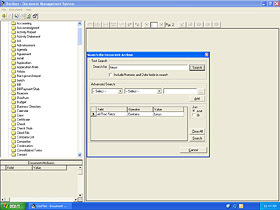 The attributes will be displayed in the lower left. 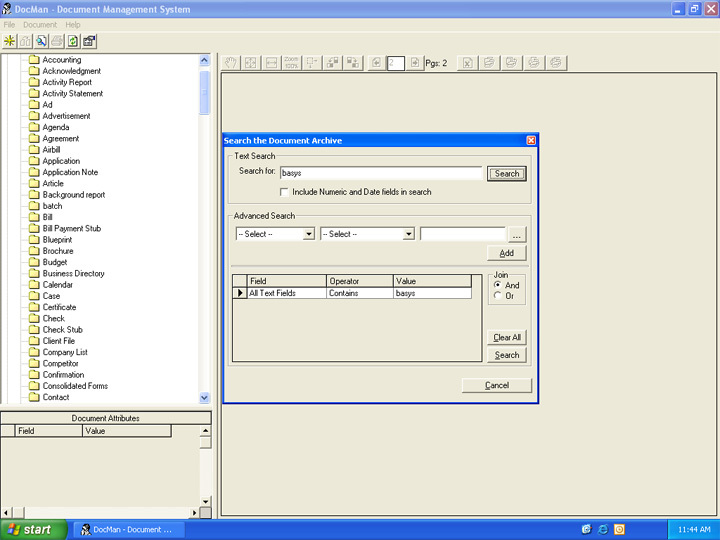 If the user is at a scanning station, the attributes can be edited, additional pages can be inserted or appended to the end of the document, or the document can be deleted. If the user is not at a scanning station, the document can only be viewed or printed. 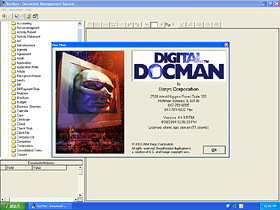 Digital DocMan allows users to zoom in on a specific portion of a document with a simple click of the mouse. This makes small print much easier to read. Documents that were scanned in landscape mode can be rotated 90 degrees. Other features include full-screen viewing and emailing. If Microsoft Outlook is installed, with one button, a new email can be created with the current document file added as an attachment. Contact PCS today to learn more about Digital DocMan. CLICK HERE to visit the BASYS website.